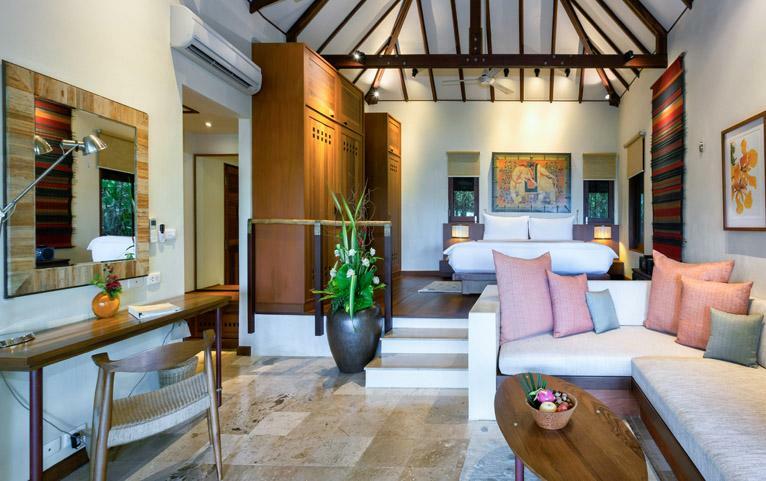 Deriving its name from the Sanskrit words kamal (lotus) and alaya (realm), the Kamalaya is a sanctuary that enables the human spirit to open up like a beautiful lotus. 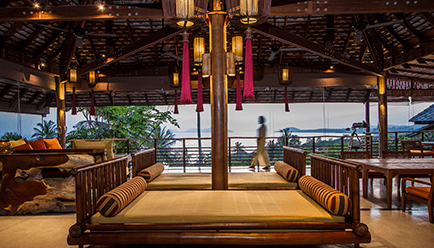 Located at the Thai island of Kamalaya Koh Samui, this multi-award winning wellness sanctuary and holistic spa resort provides a wide array of specialized services and retreats for wellness travellers. An amalgamation of traditional Eastern and Western healing therapies, it houses everything that makes for an ultra-luxe wellness retreat. 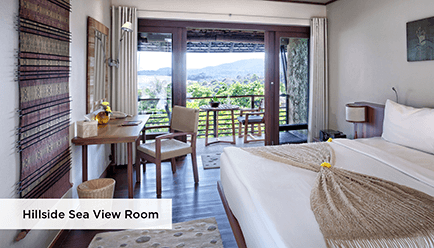 3 Nights Hillside Room Sea View - 35 sq. 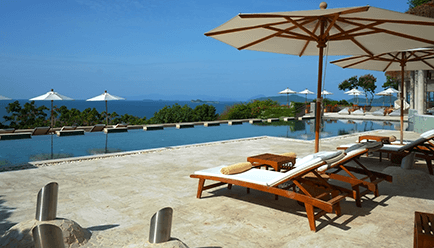 m.
3 Nights Villa Sea View - 75 sq. m.
5 Nights Hillside Room Sea View - 35 sq. m.
5 Nights Villa Sea View - 75 sq. 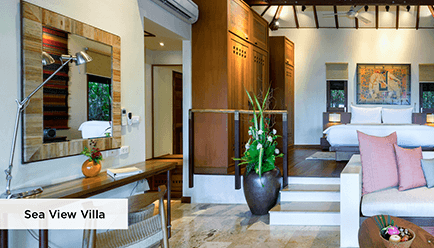 m.
With utmost attention to detail, the Kamalaya provides the perfect blend of a breathtakingly beautiful ambience, tranquil atmosphere, inspired healthy cuisine and healing therapies that help rejuvenate the mind, body and soul. 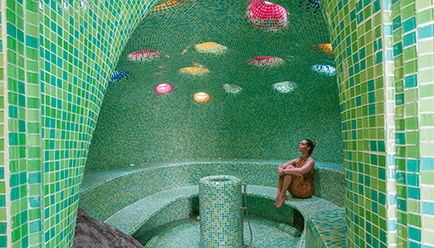 Creating seamless wellness experiences, the resort takes inspiration from a Buddhist monk's cave that once served as a place of meditation and spiritual retreat. Experience zen with complimentary access to scheduled daily holistic fitness activities like - Yoga, Meditation, Qi Gong, etc. Located on the Gulf of Thailand, Koh Samui lies off the East coast of the Kra Isthmus. 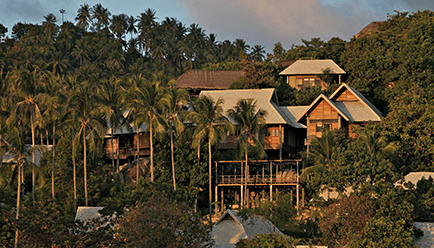 This renowned island features lush mountainous rainforests, beautiful beaches and an abundance of palm and coconut trees. 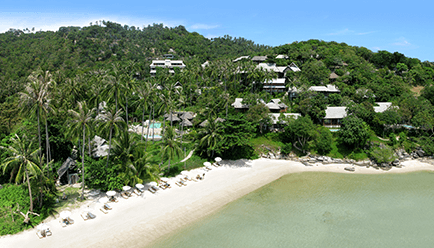 Located at the picturesque southern coastline of Koh Samui, Kamalaya sits amid a lush tropical surrounding that adds to its healing characteristics. 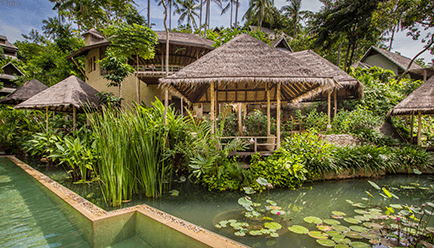 Inspired by nature itself, Kamalaya aims at providing wellness experiences that help people achieve optimal, overall wellbeing by reconnecting them to their life’s true potential. Hillside Room Garden View 35 sq.m. 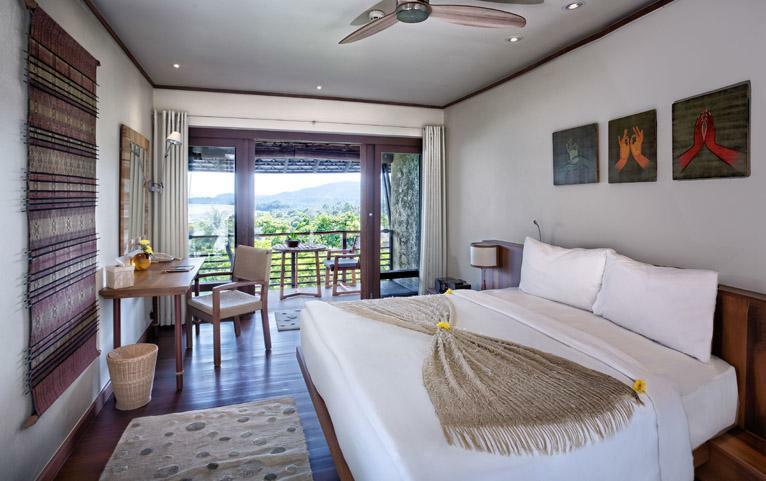 Enveloped in nature’s bounty, these rooms stand amidst beautiful boulders and trees. 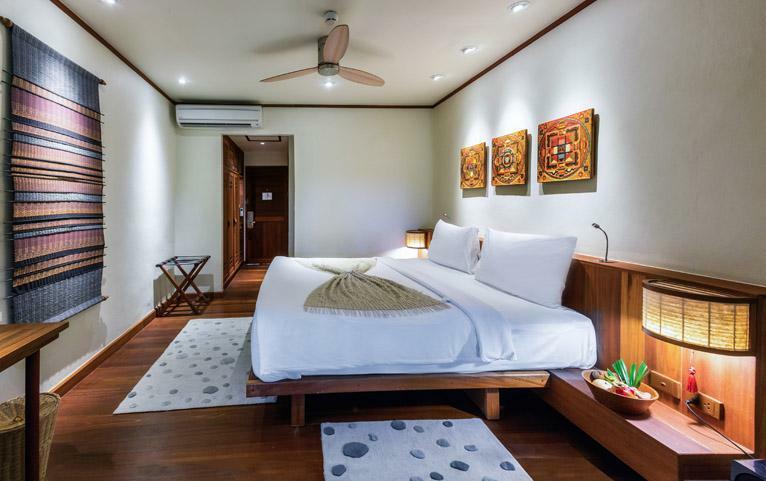 The simple yet elegant interiors of these rooms make for a cosy stay. Hillside Room Sea View 35 sq.m. Offering a magnificent view of the sea and the horizon these rooms feature minimalistic interiors. 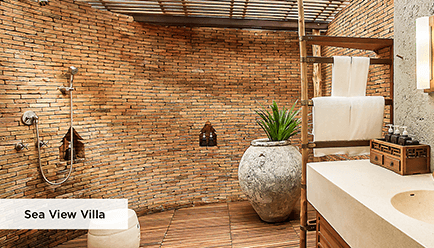 Accented with natural furnishings, these understated rooms make for a tranquil abode. Villa Sea View 75 sq.m. These luxurious villas are nurturing spaces that feature private balconies. Providing you an escape from all things mundane, these villas allow one to soak in the splendour of Koh Samui's natural beauty. Availability: Bookings are subject to availability. To confirm your dates of stay at purchase, click on 'Book Now' and select your preferred package. Use the calendar to browse and select the available dates. Dates with a surcharge and blackout dates are identified. 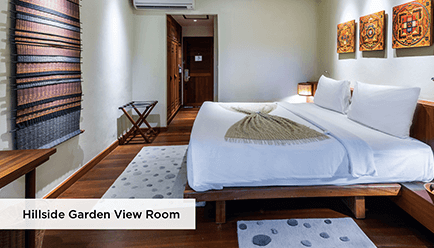 Maximum Guest Capacity: The maximum room capacity for Hillside sea view and garden view rooms is two adults and for Villas with Sea View is 3 adults. Extra Guest Policy: The resort doesn’t allow extra guests, please refer the maximum guest capacity for each room type. Child Policy: Children below the age of 16 are not allowed in the wellness centre. Kindly contact our travel concierge team for more details. Children are not allowed to use the Leisure swimming pool (located at Amrita Cafè) between midday to 4 PM. 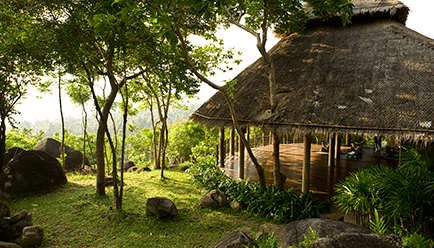 Wellness programs & retreats: Whether you wish to improve your sleep quality, lose weight, detoxify or reduce your stress levels Kamalaya offers extensive, tailor-made wellness programs and retreats that’ll help you achieve your zen state. Soma Restaurant - Located near the main facilities, this restaurant offers the majestic view of the coast and outlying island. This restaurant features a ‘community table’ where guests can dine together. Amrita Café - Amrita is a Sanskrit word that means ‘divine nectare’. 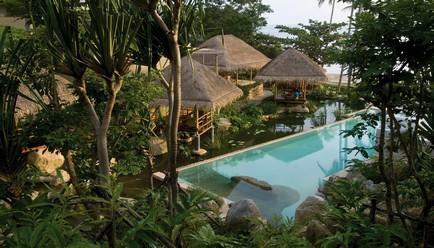 This pool-side cafe sits at the edge of the lotus ponds and overlooks the sea. The Alchemy Tea Lounge - The lounge offers refreshments and a wide-range of detoxifying elixirs, juices, medicinal herbal teas and infusions. It also offers wine and beer varieties for guests who are not on a detox diet. Located above the Soma Restaurant, the lounge also serves as a sunset point. 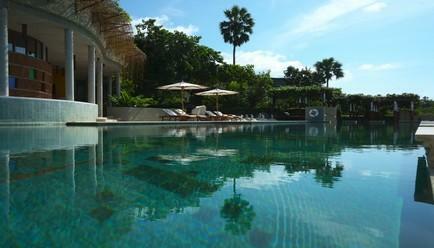 Swimming - The Kamalaya features two luxurious ocean-view pools - a lap pool and a leisure pool - that offer guests refreshing swims. 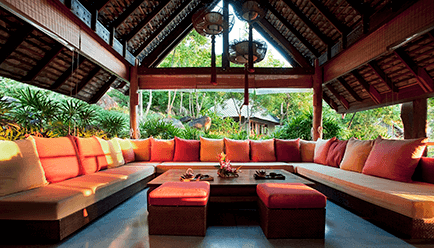 Other Facilities: The Kamalaya houses a boutique, an art gallery, a library and a TV lounge for its guests. With so much to do at Kamalaya, you can never have a dull moment. One can reach the Koh Samui airport with one-stop flights from most major cities in India including Mumbai, Delhi, Bangalore and Kolkata. 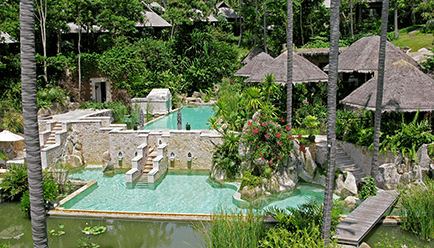 The Kamalaya is located at an hour-long drive from the Koh Samui airport.